PRIVATE HERBERT HAROLD TARTER was born on January 17, 1924, to Samuel and and Sarah Tarter. The Tarter family was living at this time at 1142 South 6th Street, the last house on South 6th Street before Kaighn Avenue. The family lived next door to Jacob Feldman's saloon at 601 Kaighn Avenue. At the time of the 1920 census Samuel Tarter was in the bottling business. Prohibition had recently gone into effect, and apparently more than soda pop was going into the bottles. Samuel Tarter sadly died when Herbert Tarter was only six weeks old. His uncle, Lewis Tarter, stepped up and helped raise him. His uncle was very active in civic affairs, and had served as the freeholder in Camden's 13th Ward. Older brother Morris, seventeen years his senior, also served as a father figure during his youth. The Tarters moved to Langham Avenue in Parkside during the 1930s. 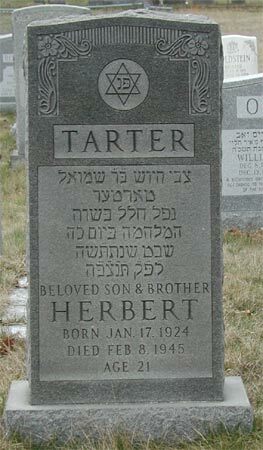 Herbert Tarter attended school in Camden NJ, graduating from Camden High School in 1942, where he took the college preparatory course of studies. Known for his wit and for skill on the basketball court, he was a student at the South Jersey Law School when he joined the Army in 1943, and served with a glider infantry regiment in the 11th Airborne Division. 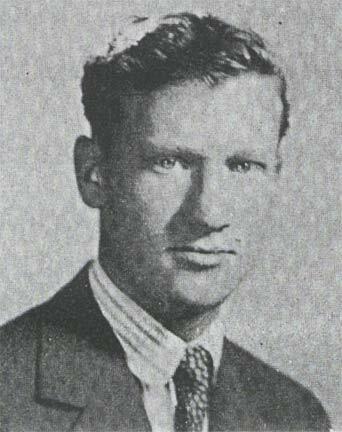 Herbert Tarter was killed in action on Leyte, Philippine Islands, on February 8, 1945 at the age of 21. He was survived by his parents, a brother, prominent Camden attorney Morris "Toots" Tarter, and three sisters, Mrs. Rose Caskey, Mrs. Evelyn Sidewater, and Mrs. Dorothy Vederman. Herbert Tarter was brought home in September of 1948 aboard the USAT Sergeant Morris E. Crain. He was buried at New Camden Cemetery in Camden NJ on October 17, 1948.